Our highly athletic stunt team has been around for over 20 seasons and is one of the best in the NBA. The Trail Blazers Stunt Team is comprised of 16 members (8 men and 8 women) and performs at all home games. You will see them interacting with the crowd, performing on the court and in the stands throughout the game to enhance the fan experience. The goal is to keep the crowd on the edge of their seats and always cheering for their Portland Trail Blazers. The team has a strong background in partner stunting and tumbling. 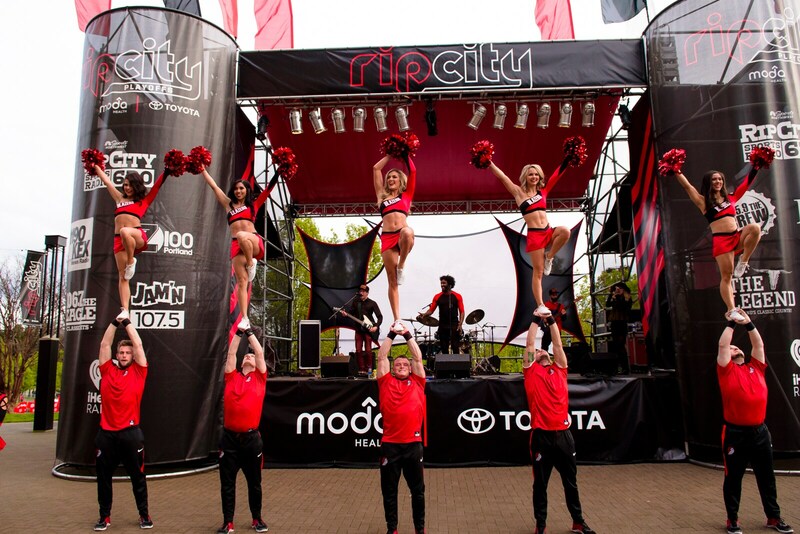 Portland Trail Blazers Stunt Team Tryouts have been set. Please fill out and bring the completed application/waiver. If you are out of state, WE DO accept videos and photos of your skills if you cannot attend the pre tryout clinic. You must be present at tryouts to be selected for the team. No exceptions. Please follow us on Facebook and Instagram for up to date information. If you have any questions, please feel free to send an email to blazersstunteam@trailblazers.com.